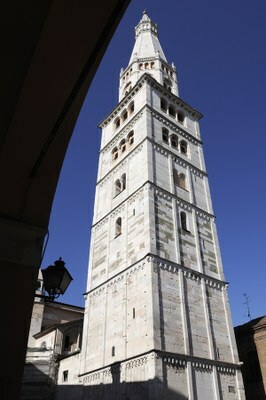 Next to the apse of the Cathedral, tall and elegant in its harmonious proportions, rises up the Ghirlandina Tower, the symbol of Modena. The name by which it is affectionately known by the people of Modena originates from the marble balustrades crowning its spire ‘like graceful garlands’. Although built as the bell tower, the Ghirlandina has since its beginnings held an important civic function: the sound of the bells marked the rhythms of city life, announced the opening of the city gates and rallied the citizens in situations of alarm or danger. 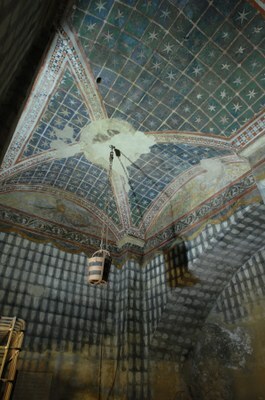 Its mighty walls were custodian to the town hall’s ‘sacresty’: here were stored the strongbox and all public documents, such as the celebrated 12th century ‘stolen pail’ (today a facsimile), the supreme object of conflict between Modena and Bologna in the raging historical battle of Zappolino (1325). The external wall of the Ghirlandina is richly sculpted in recovered stone. Much of this is from Modena of the Roman era, as confirmed by findings from the scientific research carried out during the restoration project of 2006-7. Each stringcourse cornice is decorated with overlying arches, either simple or intertwined, and figured protomes, many of which were substituted by geometric consoles during subsequent restoration. 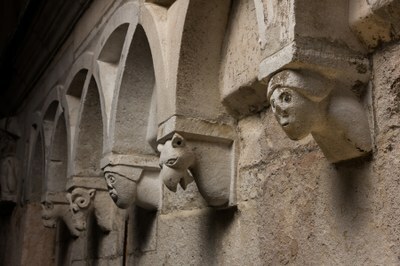 At the edges of the first three cornices there are also prestigious cornerstones sculpted with imaginary figures from medieval bestiary (cornice 1) animal and human figures (cornice 2 and 3). Inside the Ghirlandina on the fifth floor we can find the Stanza dei Torresani, once home to the tower custodians , in which we can admire capitals presumably sculpted by the Campionesi Masters. The most important are the Capitello dei Giudici, the Capitello di David and the Capitello dei Leoni.